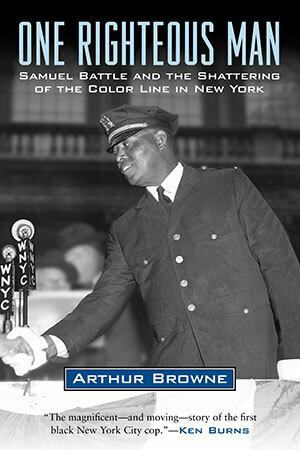 A history of African Americans in New York City from the 1910s to 1960, told through the life of Samuel Battle, the New York Police Department’s first black officer. When Samuel Battle broke the color line as New York City’s first African American cop in the second decade of the twentieth century, he had to fear his racist colleagues as much as criminals. He had to be three times better than his white peers, and many times more resilient. His life was threatened. He was displayed like a circus animal. Yet, fearlessly claiming his rights, he prevailed in a four-decade odyssey that is both the story of one man’s courageous dedication to racial progress and a harbinger of the divisions between police and the people they serve that plague twenty-first-century America. By dint of brains, brawn, and an outsized personality, Battle rode the forward wave of African American history in New York. He circulated among renowned turn-of-the-century entertainers and writers. He weathered threatening hostility as a founding citizen of black Harlem. He served as “godfather” to the regiment of black soldiers that won glory in World War I as the “Hellfighters of Harlem.” He befriended sports stars like Joe Louis, Jesse Owens, and Sugar Ray Robinson, and he bonded with legendary tap dancer Bill “Bojangles” Robinson. Along the way, he mentored an equally smart, equally tough young man in a still more brutal fight to integrate the New York Fire Department. At the close of his career, Battle looked back proudly on the against-all-odd journey taken by a man who came of age as the son of former slaves in the South. He had navigated the corruption of Tammany Hall, the treachery of gangsters like Lucky Luciano and Dutch Schultz, the anything-goes era of Prohibition, the devastation of the Depression, and the race riots that erupted in Harlem in the 1930s and 1940s. By then he was a trusted aide to Mayor Fiorello La Guardia and a friend to First Lady Eleanor Roosevelt. Realizing that his story was the story of race in New York across the first half of the century, Battle commissioned a biography to be written by none other than Langston Hughes, the preeminent voice of the Harlem Renaissance. But their eighty-thousand-word collaboration failed to find a publisher, and has remained unpublished since. Using Hughes’s manuscript, which is quoted liberally throughout this book, as well as his own archival research and interviews with survivors, Pulitzer Prize–winning journalist Arthur Browne has created an important and compelling social history of New York, revealed a fascinating episode in the life of Langston Hughes, and delivered the riveting life and times of a remarkable and unjustly forgotten man, setting Samuel Battle where he belongs in the pantheon of American civil rights pioneers.